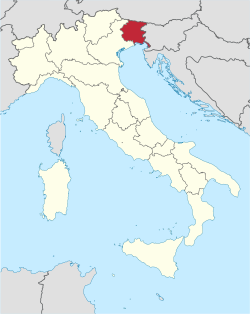 Friuli–Venezia Giulia is ane o the 20 regions o Italy, an ane o five autonomous regions wi special statute. The caipital is Trieste. It haes an aurie o 7,858 km² an aboot 1.2 million indwallers. A naitural openin tae the sea for mony Central European kintras, the region is traversed bi the major transport routes atween the east an wast o soothren Europe. 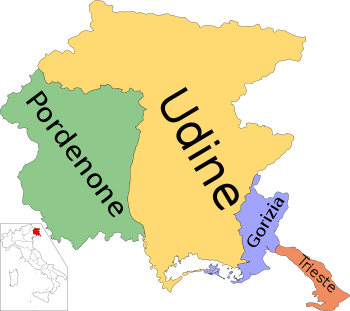 It encompasses the historical-geographical region o Friuli an the geographical region o Venezia Giulia (kent in Scots an aw as Julian Mairch), each wi its awn destinct history, tradeetions an identity. ↑ Friulian: Friûl–Vignesie Julie, Slovenie: Furlanija–Julijska krajina, German: Friaul–Julisch Venetien, Venetian: Friul–Venèxia Jułia.